Max Pellegrini was born on 29 September 1945 in Turin, where he still lives and works. He grew up in a united and protective family, in a stimulating cultural climate, and after his years at the art lyceum he enrolled in the Accademia Albertina di Belle Arti. In those years Turin was a very vibrant centre for art experimentation. There were private galleries in the city such as Notizie, Punto and Christian Stein, which brought the latest European and American trends to Italy, the informal, Pop Art; and the GAM museum, which followed contemporary explorations with interest, holding very modern exhibitions (such as the Gutai group in 1959, and the experimental museum project). Pellegrini was very young when he exhibited for the first time, in 1965, at two group exhibitions. In September he took some drawings to the graphic exhibition “Forme programmate” organised by the Polytechnic at the Castello del Valentino; he was also part of the exhibition’s regulating committee and wrote a piece on the language of comic strips for the event. In November he took part in “Prospettive I” at the Galleria d’Arte Internazionale Due Mondi in Rome. The exhibition was curated by Enrico Crispolti and Giorgio Di Genova, and boasted the participation of Renato Barilli and Luciano Caramel on its scientific committee. Pellegrini was invited with his friend Ugo Nespolo, with whom he shared a studio, by Antonio Del Guercio, his teacher at the Albertina, and presented a multi-media figurative painting. The following year, at the age of just 21, he held his first solo exhibition at the Punto gallery in Turin and at the Leone gallery in Venice. He presented fourteen oils on emulsified canvas, formulated from existing photographic images, highlighting their hidden, two dimensional, linear motives or modifying their appearance by changing and emphasizing individual parts. 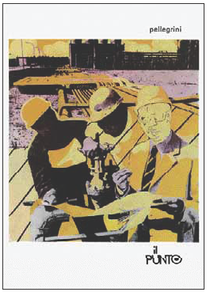 In “Gasoline” the picture is “stolen” from a daily paper: workers in a gas extraction plant are transformed and synthesised by the acid contrast of yellow and violet; in “Allegrezza per due” (Delight for Two) the photo of the woman being repeated hybridises with the drawing; in “Omaggio a lei” (Tribute to her) the dense floral decoration overlays the face of the girl, leaving only her eyes visible. The works referred immediately to Pop and the commercial and advertising languages that were becoming established in Europe in those years. Nevertheless, already Paolo Fossati, who reviewed the exhibition for “l’Unità”, noted affinities with the style of the early Novecento: “The ambiguity is studied and intended. Where the pictorial sensitivity snags in the photographic weft, the sumptuous and arabesque line of certain floral styles, certainly Art Nouveau, appears like a model based in memory”. Not by chance, Turin was the capital of Italian Art Nouveau, the city of the 1902 Universal Exposition, a triumph of the floral style and symbolism, and it was precisely to Turin that Casorati - the very first - brought some of the decorative styles typical of the Viennese Secession, with that contrast between the three dimensional aspect of the faces and bodies represented and the pure linear style of the background. At the Artistic High School Pellegrini studied with Francesco Casorati, Felice’s son, and then, at the Albertina, with Mario Calandri and Enrico Paulucci, who on one hand inspired him to redirect his attention to drawing, to the definition of the figures, typical of engraving, and, on the other, to the Art Nouveau and fauve style in the colour and composition deriving from his experience in the Sei di Torino. Despite his two solo exhibitions and the subsequent visibility, Pelligrini’s relationship with the galleries and the social and commercial world of artistic production in general remained complicated and controversial. He had always painted for himself and for his family affections, not to earn money and possibly not even to show his work, if not to collectors and friends. This was not a snobbish attitude, but a kind of shyness, a reserve that did not however prevent him continuing to work, even without a reference “audience”. So in 1967 he decided to take a parallel “official” direction and enrolled in the Architecture Department at the Polytechnic. But he did not abandon art, and ventured into independent operations and actions that demonstrate his involvement in his contemporary environment. He opened the independent Pol Mol space in his house in Crocetta, Turin. The gallery did not have any programme or commercial objective, it was mainly a place of meetings and experimentation. In its sole year of existence, the Pol Mol hosted an experimental jazz concert and a group exhibition featuring artists who then became famous: Piacentino, Zorio and Gilardi. In 1968 Pellegrini also took part in “Les Mots et les choses / Concert Fluxus / Art Total”, an avantgarde exhibition organised by Ben Vautier, with his friend Nespolo, who also involved him in actions and happenings. In the same year Pellegrini made his only performance, at the Piper in Turin, entitled “Al Piper è la fine del mondo” (The end of the world is at the Piper), in which the scene was animated by big papier-mâché elephants, a Venus de Milo in shiny, white plastic, an old vacuum cleaner and some rubbing paper on the wall, where psychedelic images are projected. The screen-prints on plastic date from 1968, reproducing groups and singers on transparent and coloured backgrounds. These were influenced by the psychedelic language of rock posters and were closer to swinging London than Warhol’s New York. Completing his university studies and moving away from the art scene, Pelligrini left to spend some months in India. It was there that he met his wife Roberta in 1969, and he painted her portrait, still dominated by symbolist lines, on the model of the “Omaggio a lei” (Tribute to her). The years immediately after saw a succession of personal events that absorbed his energy: his marriage, the death of his father, the birth of his first son Enrico, his graduation in Urban Sociology, and the start of his work at the Polytechnic. Art remained Pellegrini’s passion and he wanted to start painting and experimenting again, but did not know how. In 1973 he met the critic Luigio Carluccio, who advised him to move away from the convergence with photography and turn to the history of art. This was a turning point for Pellegrini: the repertoire of forms and images is infinite, and he appropriated them by accumulation with multiple citations, in which different times and styles coexist. 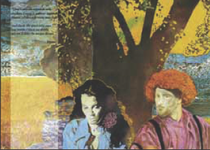 In that period Pellegrini was working on the “plastifications”, such as the “Studio da Manet: ‘Donne in giardino’” (Study after Manet: Women in the Garden), 1973: pictures with subjects taken from famous paintings in bright colours on plywood, subsequently covered with a shiny layer of plastic. Experiments of this kind continued in parallel throughout the 1980s, giving rise to an entire series (e.g. the series of ten “Donne Belle” [Beautiful Women] and the ten “Donne Brutte” [Ugly Women]). Carluccio appreciated the draughtsmanship in these works and, especially, the direct relationship with tradition and the past, away from any collective revival phenomenon and the obsession with the new (Max Pellegrini, catalogue of the exhibition at Documenta, Turin 1975). So he presented his “return” exhibition in 1975 at the Documenta gallery, in which Pellegrini showed the D’après series: re-readings and reformulations of very famous paintings of the past, from the patriotic inserts of “Idillio sulla spiaggia” (Idyll on the Beach) by Piazzetta to Renoir in “Alla fine della colazione” (The End of Lunch). The artist made a kind of surrealist alienation on the paintings. He changed the backgrounds, colours and sizes in order to achieve a new meaning, or to make them his own. The inspiration strangely came from Pellegrini’s first job as an art education teacher. His students were asked to reproduce a work, reformulating it, as a practical exercise to understand the style. So on one hand the operation had a naive origin, on the other a conceptual root. At times the isolation of three figures was enough, as in the study after Hals of the “Banchetto degli ufficiali della Compagnia di San Giorgio” (Banquet of the Officials of the Company of Saint George), to analyse their expressions, to deconstruct the work. At times it is the insertion of motives referring to the imaginary aspects of his 1960s paintings that acts as the outil visuel. This is why, in another study after Hals, the collars of the eminent officials are turned into a pop pattern, or in the study after Pontormo of the “Deposizione di Santa Felicita” (Deposition of Saint Felicitas), the veils of the pious women are covered in the stars and stripes pattern of the American flag. This was not intended as desecrating, because Pellegrini’s are not re-readings against tradition, but inside it. Rather than looking to the future at any cost, Pellegrini recomposed the past in a kind of mental collage, reproduced on canvas. At the end of the 1970s, the D’après developed and Pellegrini moved towards a definitive return to easel painting, exactly that which was negated by the avant-garde, in very large sizes. Carluccio remained his fundamental influence, directing Pellegrini towards “real painting [...] It was certainly a relationship with those who count and forever mark an artist’s career” (M. Pellegrini, in P. LEVI, Le tavolozze di Narciso, Mondadori, Milan 1994). The change was fast and visible, and Pellegrini attained the dreamlike style that also distinguishes his latest work in those years. The works are often on personal places, such as “Alba alla Crocetta” (Dawn at Crocetta) (1978-1979), with the view from the window of his house, or “Enrico?” (1979) showing the building’s stairs and one of his son’s toys. The settings are interiors, populated by a mass of objects and references that crowd the canvas; the colours in this period are also dense, dark, burgundies and browns, but also intense blues in contrast, in paintings like “La casa del collezionista” (The Collector’s House), 1978-1979 and “I miei genitori: omaggio” (My Par- ents: Tribute), 1979-1980, which immediately bring to mind another great Turin outsider, Italo Cremona, who was also heir to a surrealist, narrative, introspective, dream-like and symbolic imagination. In 1980 Pellegrini took part in the special event “Il tempo del Museo Venezia” at the Magazzini del Sale during the Venice Biennale. Carluccio died the following year, but not before having suggested Pellegrini’s name as an emerging talent for the next Biennale, to which he in fact returned in 1982 in the “Aperto 82” section curated by Tommaso Trini. He gained a lot of visibility in those years of work and over the course of the 1980s Pellegrini painted and exhibited regularly at foundations and private galleries. This was the decade when painting was being re-evaluated in Germany and Italy; that of the “new subjectivity”, although Pellegrini’s painting does not fit easily into any categorisation (Ceronetti was later to write, addressing himself to the artist: “Anyone who wants to define you doesn’t like you”). Pellegrini mixes any object, architecture, figure, colour; in a painting like “Sogno di un bambino” (A Child’s Dream) of 1981 there is the setting of Perugino’s “Delivery of the Keys”, though turned from being a clear example of Renaissance perspective and order into a dense, dark, dreamy moment, possibly referring to the children led by the personages in the foreground (men in women’s clothing, as in a typical mediterranean traditional feast). In “Sogni di gloria” (Dreams of Glory) (1982) Picasso and De Chirico meet in a studio overladen with classical statues, canvases, d’après and landscapes. In 1982 Pellegrini presented his recent work at the Galleria Civica d’Arte Moderna of Ferrara. It was an exhibition of “copious and Fellini-like, magical visions” (S. FURLOTTI REBERSCHAK, in “Gazzetta”, 10 October 1982), compared, in the catalogue, to the stories of Sherazad in the Thousand and One Nights: a story, a different narrative in every picture (Janus). The references are layered creating elaborate wefts, in paintings like “L’ultimo Tiziano” (The Last Titian) (1980-1981), in which the figures in Titian’s “Pastoral Concert” are not so intent on listening to music in an Arcadian setting, but are perhaps in danger because of the fixed stare of four soldiers on the outskirts of a town. Pellegrini’s painting is traditional, but at the same time, due to his fondness for studying and reformulating existing pictures, has characteristics similar to some Post-modern trends, particularly in his use of citations and juxtapositions. Pellegrini likes to define himself as a “conceptual who paints”, with a great liking for the avant-gardes developed at the end of the 1960s, which he knew and knows first hand. He has devoted himself, alongside his artistic practice, to philosophical speculation, both in the field of sociology of art - his teaching subject at the Polytechnic - and that of aesthetic reflection. 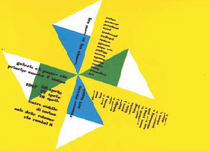 In an exchange of letters printed in the catalogue for the exhibition first at the Davico Gallery and then at the Toninelli Arte Moderne in Rome in 1985, Pellegrini discusses the truth of art in Gadamer’s thinking with Gianni Vattimo, and recounts his thinking on the value of the work: “It seems to me rather more modestly that what is proposed as a work of art, lasting in time, whose unity and truth can be immediately and intuitively grasped, takes its power not so much from the subjectivity of the artist who produced it (of whom I can know nothing) nor from the society (past, present or future) that receives it; but from the object (e.g. Vermeer’s Lacemaker) in its being in that moment, in its blend of forms and colours”. It is a slightly formalist interpretation that Vattimo “corrects” through Heidegger, pointing out that the truth of art cannot be separated from history, memory and the references it contains. Later, in 1996 (?) the “Rivista di estetica” published his Open letter that referred back to the publication of the sociology lessons. The central theme and conclusion were precisely the possibility, in the Post-modern, of attaining conceptual results by painting, breaking the nineteenth-century schemas and cliché’s that saw painting as an expression of the “personal”. Pellegrini worked for months and years on his big paintings, following thoughts and interpretations closer to theoretical speculation than gestural immediacy. Tradition is also expressed through precise, academic technique (in a positive sense, not of rhetorical representation) and in 1987 at the Le Immagini studio he presented his drawings, which recall the master engravers of the past and the teaching of Calandri at the Albertina. In 1989 he met Philippe Daverio and exhibited several times in his gallery, and in the collective exhibitions he curated such as “Anni ottanta in Italia”, at the former San Francesco convent in Sciacca or in the Kriterion pavilion at MiArt. The point of arrival was to be the anthological exhibition at the Palazzo Sarcinelli in Conegliano (Treviso) curated by Marco Goldin, in 1996. The selection mainly featured oil paintings dating from the early 1980s and particular attention was focused on the religious theme. This had become central between the two decades and was interpreted with an entirely personal sensitivity, rich in Christian symbols and allegories as references to the present. His work was presented in the catalogue by the French critic Jean Clair, who identified in Pellegrini a pure and “innocent” look, and compared his painting to that of Maurice Denis, emphasising precisely the manner of confronting the idea of spirituality: “An icon, this had become his ideal: not a naturalist image, nor an idea dressed in sensitive form as the symbolists wanted, and not even a parching of the richness lavished by the senses and a rarefication of the world’s profusion, as was practised by abstraction, but something that descends precisely from the sacred, conforming to a tradition dating back to the Council of Nicaea and its decisions on the meaning and value of the image, real incarnation of the divine Word”. The 1996 exhibition was followed by others, such as “Paesaggi”, again curated by Marco Goldin, in 1997, and the collective “Per amore” at the Palazzo Sarcinelli in 2002. Once again, however, after the initial impetus, Max Pellegrini withdrew into himself. He continued working at home on large canvases, cultivating his relations with friends and collectors. Again in parallel with his fellow Turin artist Italo Cremona, Pellegrini confined himself to his studio, close to his family affections. His works appeared on the covers of two novels by his son Enrico, with whom he works in 1993 on the small book Pippo e Superpappo, an ironic and amusing portrait that recounts a strong fatherson relationship, based on everyday life and sharing. In these years he never stopped painting, attaining a more rarefied and pacified style compared to the dark horror vacui of the 1980s. The citations became less precise, but the narrative capacity expressed in more markedly classical and symbolic subjects remained: from “Psiche e Amore” (Psyche and Cupid), to “La morte del fauno” (The Death of the Faun) and “Narciso che guarda Ofelia annegata” (Narcissus Looking at Drowned Ophelia). 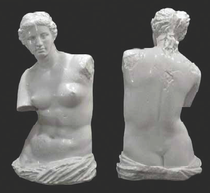 The figure of the woman returned as absolute protagonist, at times dark and evil, as in the series of the “Vanità” (Vanities) or the “Cattive madri” (Evil Mothers), at times angelic, maternal and forgiving, as in the “Regina della Notte” (Queen of the Night), at times free and positive, as in “Vita di un’anarchica” (Life of an Anarchist), dedicated to his wife Roberta. 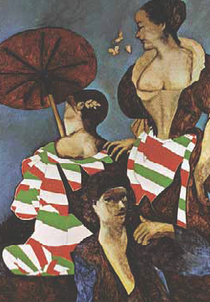 The influences of the Art Nouveau and Secessionist style of the 1960s paintings returned: the figures are often frontal, or in static poses, their symbolic value surpasses that of representation; the clothes and settings turn into elegant decorative lines, in two dimensional juxtapositions of balanced, harmonious colours, as in “Il bacio del principe” (Prince’s Kiss), where the chamelon almost becomes a jewel, or in the flight of “Le cattive madri n. 1” (Evil Mothers No. 1), with graphically outlined birds and bats that stand out in an elegant contrast against the flat background. 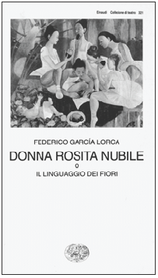 The linear quality is delicate but pervasive, and accompanies the stratifications that have always exemplified Pellegrini’s style, as in “La Regina della Notte e della Luna: l’alba e il giorno (i pastori, l’arrivo degli Angeli, i regali e i Magi: la fede nella pittura sconfigge i giganti! )” (The Queen of the Night and the Moon: dawn and day [the shepherds, the arrival of the angels, the gifts and the Magi: faith in painting defeats the giants!]) in which almost transparent faces and plants are interwoven in chiaroscuros of symbolist derivation. Over the course of ten years Pellegrini went back to the paintings, reworked them, constructed them in “layers”, corrected them, initiated series or returned to iconographies of his past works, as in “Vita di un’anarchica: i ricordi delle anime accese” (Life of an Anarchist: Memories of High Spirits) (1997-2009) which takes up “Vita in sintesi” (Life in Synthesis) (1982). It was not until 2011, after years of diligent inactivity, that a friend and admirer, Furio Colombo, chose him as an artist for the Italian Pavilion at the Venice Biennale - as always in Pellegrini’s career, due to his shyness, he paints, but someone else impels him to exhibit in public. The occasion was a new start and, with the founding of the Pellegrini Legacy Trust, his work once again became public, exhibited and examined in view of a profound reconsideration of his unique experience in the contemporary scene.